After having a successful launch of our first eBook "6 Months to a 1000$ per Month Blog", we have tons of requests to share the entire eBook scenario that we worked out in the last couple of months. In short; it was fun and required a lot of work too. The series that we have here today is meant to be THE series, that would be sharing every bit and piece of the entire process that is required for you to follow in order to look forward to a successful eBook launch for your blog. There was a lot that i learned over the time of how experts increased their email subscribers, and i bet they were right! Really wished that i started this all up the very first day of BeH. So now that we have gone through all of this and setup a solid auto download system for the eBook, we have here a comprehensive guide, that you can go through an start up your eBook today to grab email subscribers fast. Its the root here. Think of an eBook topic that you believe your readers would love to read. Once you've an attractive offer and plus on the top of that for FREE, a reader cant stay behind becoming a subscriber. To make sure that the subscriber gets his download copy right away once he/she subscribes, you need to setup an auto responder service that would redirect the subscriber to the required download page that you would make. I'm are currently using aWeber auto responder that charges 1$ for the first month and 19$ per month after that. There are couple of packages that they offer too that you can avail. Though ill cover up why aWeber is the best auto responder out there in the online space, for now, just consider it THE best thing out there. Go to aWeber.com and signup for 1$. Once done, you'll be blessed with their powerful yet easy to use dashboard that can make you huge, in terms of a massive email list. Once your auto responder is set, you need to upload your eBook somewhere. That can be either on your own hosting OR, in case you don't have one, or your blog is hosted on Blogger (google servers), then you could use any other free hosting service. Google drive works great in this regard. Once you're logged into aWeber's dashboard, you'll notice "My List" option right in the top menu. 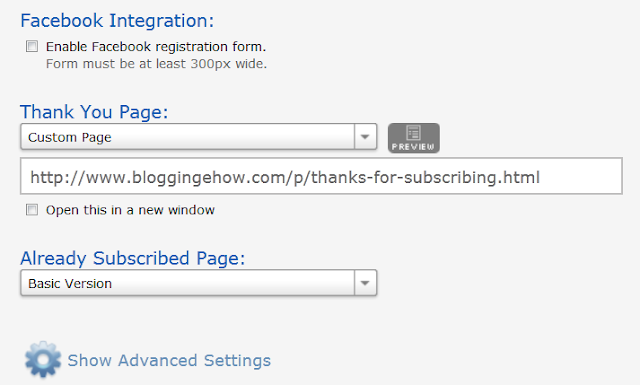 You can either make a custom email subscription form via aWeber's own subscription form design options. There are bunch of great subscription forms that you can choose from. You can even choose among their types i.e PopUp, Lightbox, sidebar etc. What is this Auto-Download System all about? By auto-download system, you can make sure that you sleep tension free when you readers would want to download the eBook any time any where in the world. They just provide their email address in the email subscription form on your blog and they are redirected to the download page of the eBook BUT only when they confirm their emails. This is to make sure that you get honest subscribers who are actually interested in the product that you're offering. 2- He is redirected to the "thanks page" where he is asked to confirm his/her email so that he could then be sent the download link. 3- Once the confirmation is made via the confirmation email, he is then automatically send a "Follow-Up" message for the eBook download link, also, the subscriber is redirected to the eBook download page on the blog too. So both of these opportunities are provided to them so that they don't miss the download link. Every subscription form has their own settings where you can add a thanks page URL that would be redirected to once the subscriber enters his/her email ID. Now finally, once your thanks and download eBook pages are done, you've to setup a follow-up message containing eBook download link. Make sure that you provide the direct download link to the eBook file so that it loads up fast. Any interruption in the download, such as timers or subscriptions would make it of less or no worth as people would get annoyed and wont download the eBook, thus might unsubscribe. Thats all! Now you can expect your email subscribers to boost up pretty fast. There is much more that we can do to increase the email subscription rate apart from eBook downloads, that ill be sharing in the future posts InshAllah. Stay blessed for ever guys! Hope every one of my BeH family member has read our eBook. Your suggestions are always honored. Would love to know what you guys thought of it. BloggingeHow | Making Blogging Simpler: How to Setup an eBook Auto Download System Using aWeber?